And so I find myself with a completely white bedroom. White walls, crisp white ceiling, white window frames and piles of ornate coving around the edges of the room that look as though they’re made of royal icing. 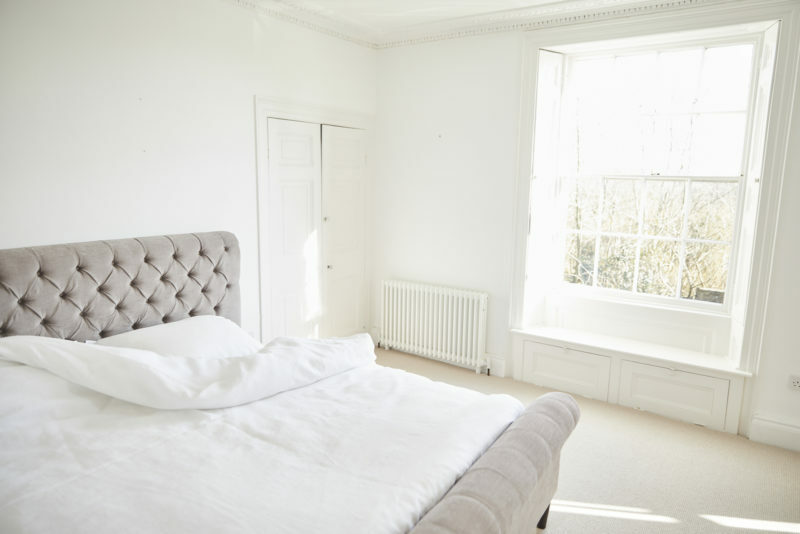 Sometimes I lie on the bed and imagine I’m living inside a big wedding cake, which isn’t particularly a bad thing – in fact the freshness of being in an all-white room is rather a nice change from the warmth and comparative darkness of a slick, mid century sort of space. But I don’t have a clue what we’ll do with the bedroom. Wallpaper it with something grand and striking? Keep it white and hang amazing artwork, gallery-style? Have some sort of huge statement chandelier dropping down from the ceiling? I have no idea. And no energy to think about it, so for the time being I am using bed linen as an easy way of totally transforming the room with no real commitment or effort. A bright throw to add a splash of colour if I’m feeling dreary, crisp white linen if the sun is shining and I want to feel as though I’m somewhere exotic and hot, clashing patterns and colours all piled up in layers if I fancy feeling a bit decadent. I remember when we first decorated our bedroom in the old house and the wallpaper was far darker than I had expected – almost chocolate brown – and I stood in the corner wondering what an earth I’d do to lighten the whole thing up. 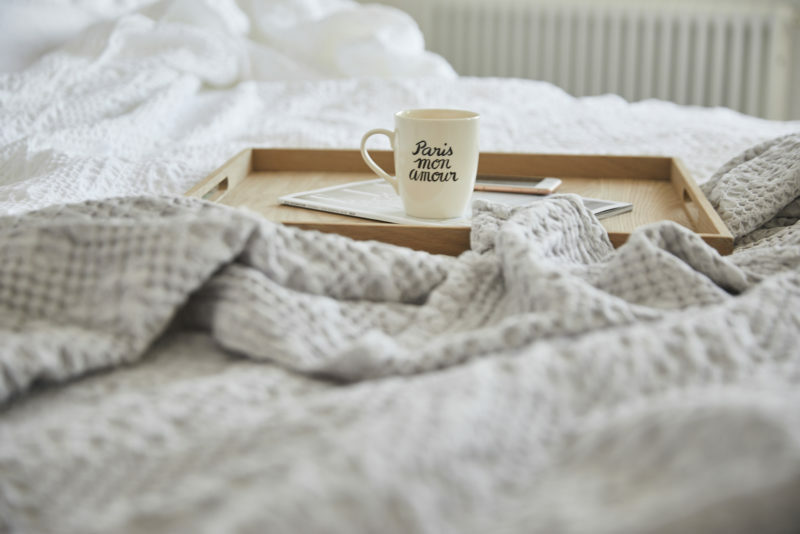 It wasn’t until some beautiful white sheets arrived and I put them on the bed that I realised what a huge difference bed linen could make – especially in a smaller room where the bed takes up the majority of the space. The blankets, cushions and duvet cover can completely change the feel of the room. So here’s my new bedroom with a whole load of colour thrown onto the bed. All of the linen and throws and cushions in this post are from British brand Christy, who have been producing fine bed and bath linens since 1850! They make beautiful, classic designs but also have some very modern, bold ranges thrown into the mix. Here I’ve used the Christy Truro bed linen set as a bold base to my colourful pile-up. It has a really exotic oversized floral design and the colours are so rich and luxurious. 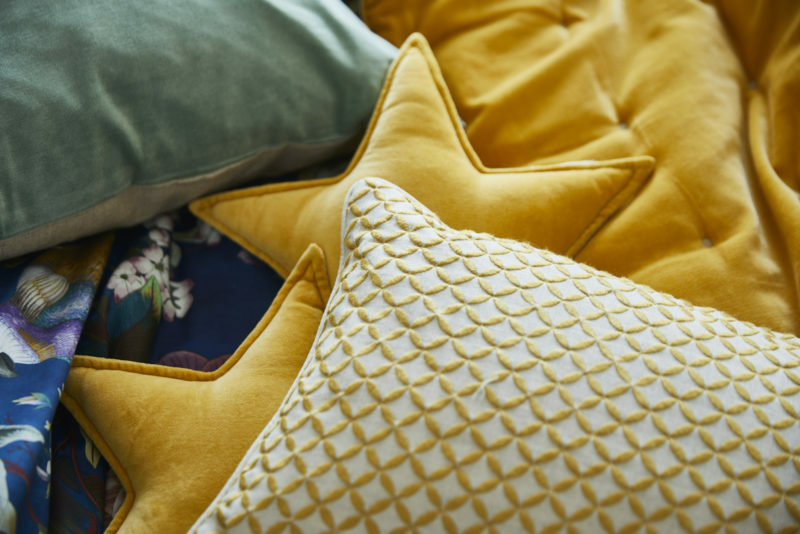 I’ve then layered the Christy Jaipur cushions and throw in Turmeric over the top with the Atlas throw in Teal piled on top of that! I love the luxurious, slightly eccentric feel of layering up lots of textures and colours – the mustard shade of the Jaipur throw is very fashionable at the moment, but against the blues and teals it has a completely different sort of appeal. Here I am posing (check me out!) 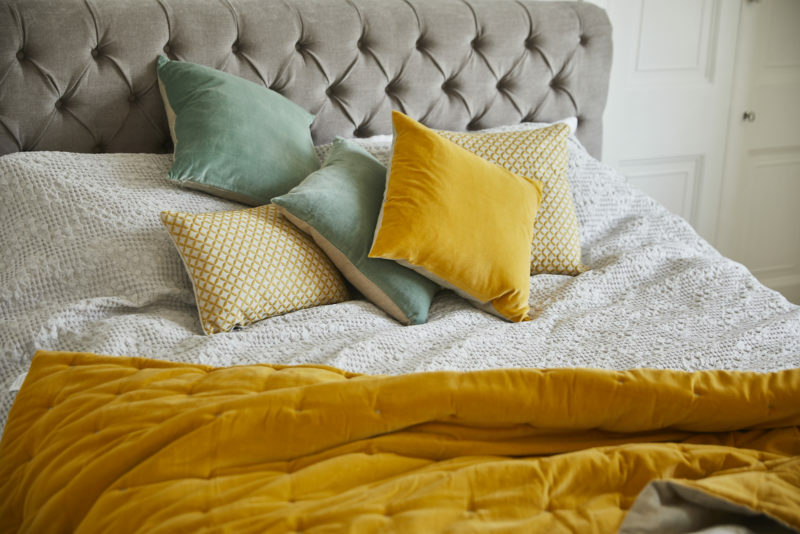 against a backdrop of pure bed linen heaven; the Jaipur throw and cushion in Turmeric, an extra little Jaipur cushion in Jade, two Penzance cushions in Turmeric for a bit of elegant patterning and the gorgeous Christy Upton throw in white covering the bed beneath. 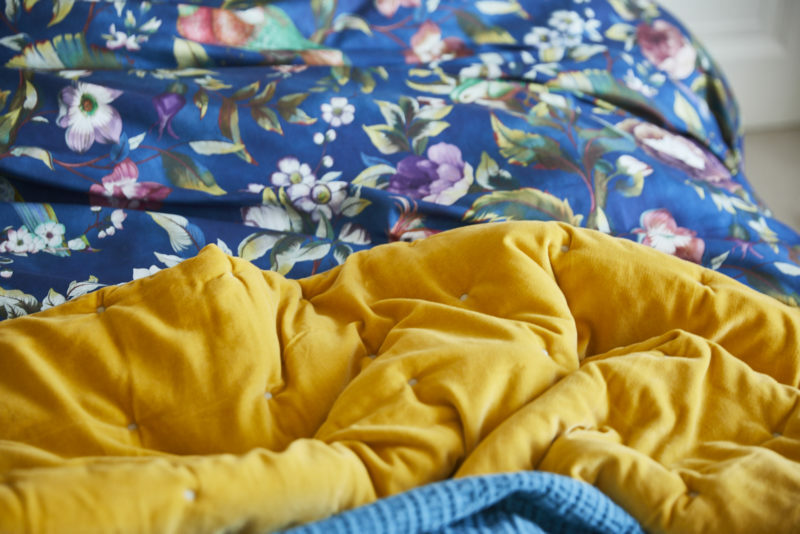 There’s something so irresistible about tactile blankets and throws – whether they’re soft and velvety or you can feel the texture of the weave, they’re just a bit more interesting and inviting than a plain duvet. But back to the bed linen and the bright, white room. Because of course there’s nothing wrong with clean, crisp white linen in a clean, crisp white room; I’ve also been embracing the classic hotel sort of vibe with Christy’s Vintage Washed Belgian Linen, which looks and feels incredibly inviting, and then not one but two Upton Throws in both Silver and White to keep things cosy. I think that this will be my “summer mode”, because I quite like the richer colours for the colder months – adds a bit of life to the party – but it just all feels so clean and relaxing. Like being in a posh seaside resort hotel, with the curtains blowing in the breeze and the sound of seagulls and the clink of ice-cubes in a glass of water…except not at the seaside, and without curtains. And with a cup of herbal tea instead of water. So there; my plain white “wedding cake” bedroom quickly transformed with a few easy splashes of colour and layers of texture. 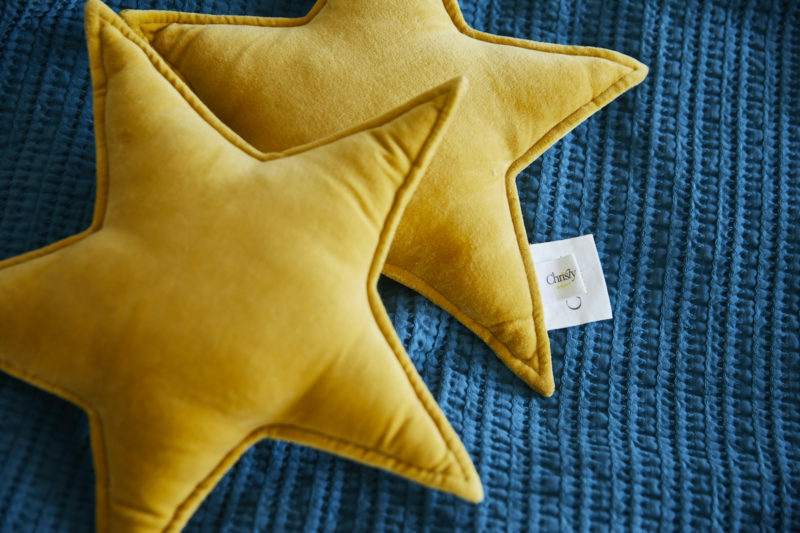 I actually took the photos for this post a few weeks ago and since then a lot of the things I’ve mentioned above have gone into a quite spectacular sale, so get yourself across to Christy.co.uk to pick up a few beautiful room-changers! This post contains paid-for advertorial with Christy.